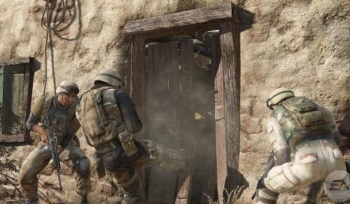 Medal of Honor Executive Producer Greg Goorich knew the inclusion of the Taliban as a playable faction might be controversial but says the actual extent of the outcry took a real toll on the morale of the development team. Sometimes it's not enough to see trouble coming. Every now and then, the harmless-looking snowball arcing toward your face has a hard, heavy core of ice and gravel packed inside it. And when it smacks home, it hurts. That's what happened to the Medal of Honor team at Danger Close, according to Goodrich, who said the team saw the snowball coming but had no idea what was actually inside. "I don't understand why [the Taliban controversy] came when it did but it came and it hurt. It was a morale hit and everything," he told CVG. "Our intentions have never been anything but honorable and this Medal of Honor game is no different than any Medal of Honor game that has come before it, in that regard, in our intent and our tone. But because, on a character selection screen, three of those characters were called Taliban, that caused a problem and that's what everyone focus on," he continued. "Everything else that we'd done kind of went away and everything else that we'd talked about and they weren't looking at the entire piece and the entire message." Part of the surprise may have resulted from the timing of the uproar, which Goodrich said was "odd" because it came so long after the presence of the Taliban had been made public knowledge. "We had the beta out, the game was out. I mean we talked about the story, the modes and we talked about who the enemy was and this and that," he said. "And then the beta came out and people played it and then the beta ended and it just erupted. It was odd." Goodrich's comments aren't too far removed from those of Electronic Arts CEO John Riccitiello, who said earlier this month that the controversy "kind of caught me by surprise." I'm not sure where all this shock and anguish is coming from since I can't think of too many things more instantly controversial than turning murderous Taliban scumbags into the Blue Team, but Goodrich still believes that the true intent of the game will be clear when it's released. "I'm really confident that when it does come out and if [critics] are paying attention and if they care to understand truly what our game is about they'll realize what we've done is the same thing we've always done and that's pay tribute to the soldier," he said.